The February 2018 issue of OVERDRIVE is out, rocking, and selling out fast! If we're completely honest, we were planning to take it easy this issue. So naturally, Murphy kicked into high gear and despite our best efforts, the new issue of OVERDRIVE is tanked up and ready to go. It's waiting for you at the newsstand so your ride can begin! 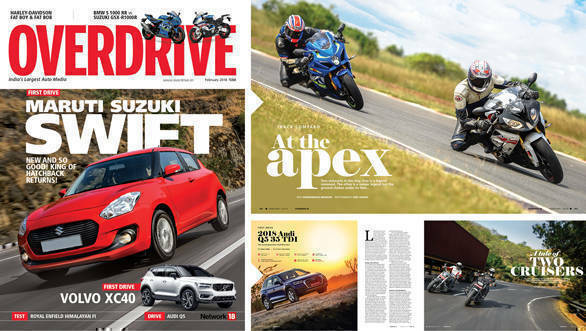 We've got cruisers, sportsbikes, superb SUVs, the new hatchback benchmark and a brand-new section that we are hoping will inspire the living daylights out of you. And that's just a top of the pops summary of the issue. Want to know more? This new feature - you'll see more of these in the future - are very close to our heart as a team. These are stories of normal men and women who got off their lazy chairs and got to work making their dreams come true. We start the section with the story of Anuradha and Manas Dewan who gave up a near-ideal life for a 100-day run through Europe that's changed them. And the story isn't a memory-lane meander either. It's focussed on showing you how easy or hard it was for them - and by extension for you - to achieve your dreams too. We have, ahem, a few of them in the issue. The big one, of course, is the 2018 Maruti Suzuki Swift. The new generation is off to a flying start and we have the full story in this issue. The small one, in size, is the new Datsun Redi-GO with the AMT. The really cool one is the Nissan Leaf but then we have the Scandinavians who really know what cool means. Just take a look at the Volvo XC40! Oh, also some vintage cars, a primer on how to shoot better car pictures, the new Audi Q5... We told you Murphy's been working hard. We gave the big story which is our first test of the BSIV Royal Enfield Himalayan. This is an important motorcycle because it needs to make good on all the promises the motorcycle made. But the other two stories are even more special. Abhay took the new Harley-Davidsons Fat Boy and Bob for a jaunt and loved the new Softails' feel while Shumi got to test and compare the stunning BMW S 1000 RR with the sweet Suzuki GSX-R1000R at the racetrack, with a couple of extremely fast riders to help him out. Shumi and Vaishali also went to the 2018 Dakar and their reports are in the issue too. Vaishali has all the action from the beginning to the halfway mark, while Shumi gives you a feel for the size, scale and taste of the Dakar from the gritty stages to the hardly less calm overnight camps. It's an issue that will blow you away with the spread of stories in both nature, intent, photography, and writing. Pick up your copy now!